A doorman greets you at the arched entry of the newest restaurant on the Turks and Caicos island of Providenciales. As dusk turns to nightfall, you’re impressed by this alfresco restaurant’s ambiance of palm trees, soft music, smiling servers, and the sheer length of a gleaming Airstream food truck. Say what? For the past decade, the owners of Coco Bistro, Providenciales’ most popular restaurant, wondered what they could do for a culinary encore. 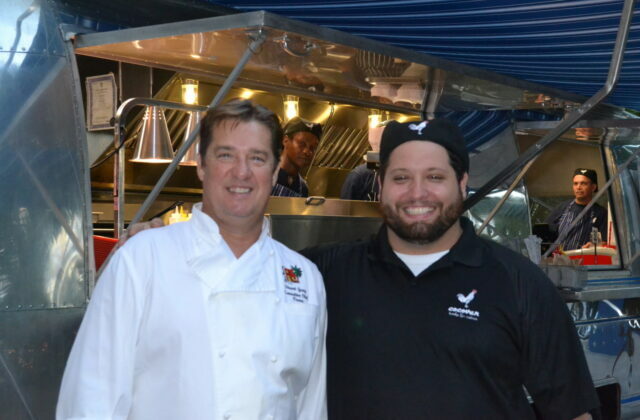 Steve Murray and Chef Stuart Gray watched from afar as the restaurant on wheels craze swept throughout the U.S. and Canada. 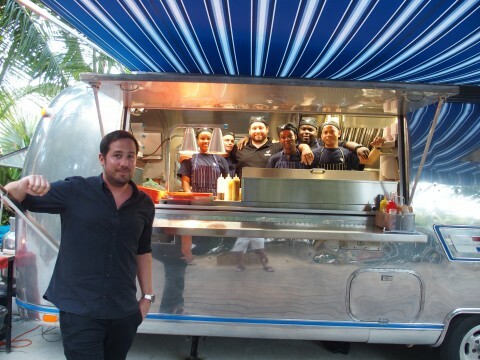 Was Turks and Caicos ready for their island’s first-ever food truck? In January of 2017, Cocovan was born in the form of a 37-foot Airstream that Murray and Gray discovered in Ohio. On the heels of having their 1974 Airstream shipped from Miami, Murray and Gray spent a month concocting menu ideas that would make Turks and Caicos vacationers sit up and take notice. Murray and Gray had discussed the idea of a second Providenciales-based restaurant for years. At the same time, they wanted to be sure that their second culinary venture didn’t compete with Coco Bistro. After first considering a double-decker bus as their Coco Bistro counterpart, Murray and Gray eventually fell in love with a well worn Airstream Overlander they discovered in Ohio. After purchasing the Airstream, the entrepreneurs tapped P & S Trailer in Helena, OH, for giving their newfound 42-year-old treasure a facelift. Once the renovation was complete, they shuttled the Airstream to Miami in order to transform the Airstream’s interior into a fully functioning kitchen. 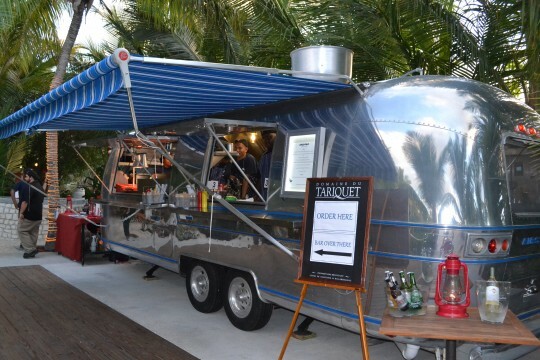 Murray and Gray chose Miami’s Uni-Source Supply for designing the Airstream’s kitchen, as well as adding a massive rooftop HVAC system for supreme cooling and ventilation. Once the Airstream’s kitchen was in place, the next step was to ship the trailer to Providenciales in time for a winter vacation season opening night. 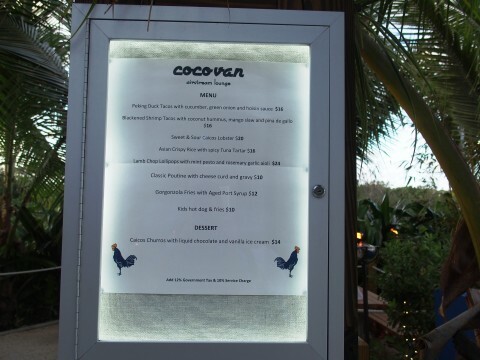 The first thing new Cocovan patrons observe is this outdoor dining experience feels Caribbean chic. This warm and fuzzy reaction is exactly what Murray and Gray hoped for after situating their new restaurant space in the same thriving coconut grove that vaulted their first-born Coco Bistro restaurant to the top of Turks and Caicos’ foodie reservation list. First time dining customers stop dead in their tracks when absorbing the sheer wingspan and polished chrome of Cocovan’s vintage Airstream turned food truck. The Airstream is a magnet for car buffs, trailer buffs, and those who thrill to something new and exciting. 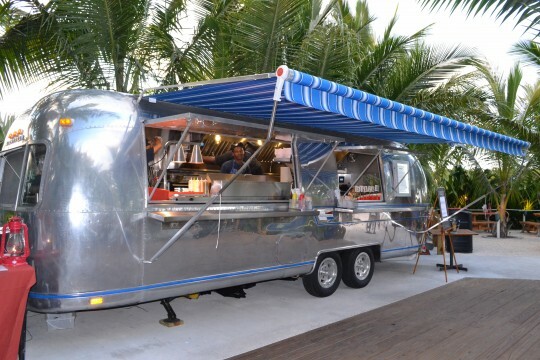 The Cocovan four-wheeled bistro is a Turks and Caicos original. The Airstream’s curious admirers discover that the food truck’s pristine exterior is matched only by the trailer’s custom kitchen. 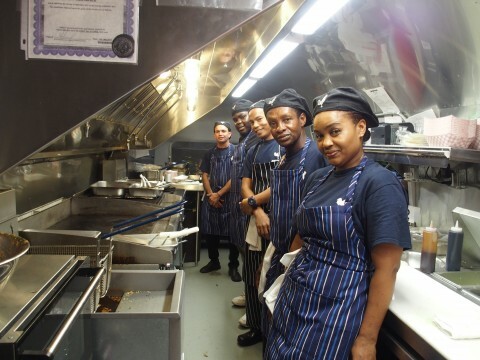 Murray and Gray made a point of choosing a food truck that would provide ample elbow room for up to seven members of the Cocovan culinary team. Customers ooze from right to left along the Airstream while perusing menu options and observing kitchen crew theatrics through the open window. Your final stop before grabbing a table is ordering a beverage at the petite cocktail bar stationed at the food truck’s far end. You find this logistical flow is as smooth as the Bambarra rum that a winking bartender recommends as a Providenciales’ favorite. Patrons shift to upscale picnic tables that are embraced by a Feng-Shui blend of palm trees, Tiki lights, and soft music invisibly piped from somewhere in the palm fronds above. Just as you count your blessings for Turks and Caicos’ wonderfully temperate climate, your server arrives with an array of delicacies that are worthy of eating on fine china. 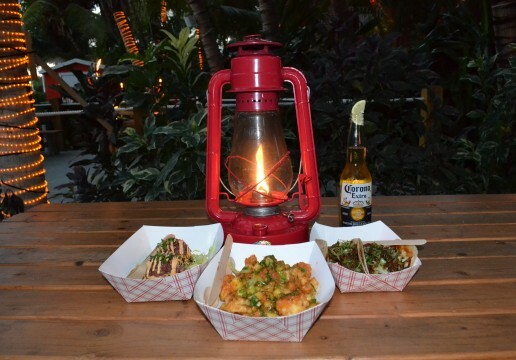 Tonight you choose from a menu featuring Sweet and Sour Lobster, Peking Duck Tacos, and Tuna Tartare. You pinch yourself three times for vacationing in the Caribbean, dining under the stars, and savoring delicious cuisine that amazingly came from a classic Airstream food truck. Talk about making a memory. 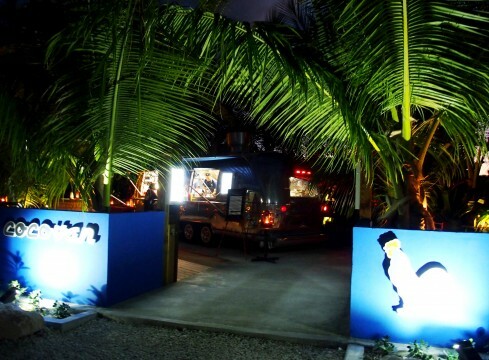 It’s probably just a matter of time before food truck number two arrives in Turks and Caicos. Parking a vintage Airstream anywhere causes a buzz. Morphing one into a restaurant near legendary Grace Bay Beach, and people are bound to talk. You have to believe that’s what Cocovan’s smiling owners planned all along.